It might surprise you to know that in a set packed with powerhouse monsters and supercharged Spell and Trap Cards, my favorite cards from Shining Victories are Mausoleum of White and Sage with Eyes of Blue. As you may have seen in our primer for building a Blue-Eyes White Dragon Deck, those two cards are incredibly valuable to the Blue-Eyes strategy, but that’s not the only place they can shine! Head on over to the Card Database and run a search for Level 1 LIGHT Tuners (put a 1 in both Level/Rank boxes, then click LIGHT and Tuner), and you’ll see what I mean. If you’ve got the right boxes filled and checked off, you’ll find that there are 30 different Level 1 LIGHT Tuner monsters in the game, spanning a variety of different Deck types and themes, with a few generally good cards thrown in. You probably already know that Sage with Eyes of Blue can search out Effect Veiler to shut down a monster’s effects, but did you know that it can also search out Hanewata to nullify a whole turn’s worth of effect damage? 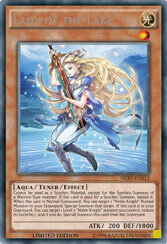 Fans of Noble Knights love Lady of the Lake, but have often found it difficult to use her as early or often as they’d like. Mausoleum of White is a huge help here, since it can send Noble Knight Artorigus straight to the Graveyard to power up one of your Knights AND give you the extra Normal Summon you need to play Lady of the Lake, bring back Artorigus, and Synchro Summon Ignoble Knight of High Laundsallyn! This play even works after using the effect of Merlin or Noble Knight Brothers in the same turn, increasing the number of strong opening hands available to you. “LIGHT monsters” probably aren’t the first thing you’d associate with Jack Atlas, but in fact, 3 of his “Resonator” Tuner monsters are Level 1 LIGHT monsters! Chain Resonator, Mirror Resonator, and Barrier Resonator can all be searched out with Sage with Eyes of Blue and can be Summoned using the extra Normal Summon from Mauseolum of White. Barrier Resonator actually adds value to the Blue-Eyes Deck, giving you a searchable method of protecting a Crystal Wing Synchro Dragon/Secret Village of the Spellcasters lockdown. You can drop Barrier Resonator from your hand to target your Maiden with Eyes of Blue, allowing you to Summon a Blue-Eyes White Dragon, protect her from battle for the whole turn regardless of how many attackers your opponent can field, and protect yourself from the associated battle damage all at the same time! Outside of the Blue-Eyes Deck, the fact that Chain Resonator is compatible with both Sage and Mausoleum was the driving force that led me to create a very cool Red-Eyes B. Dragon/Red Dragon Archfiend Deck for in-office Dueling! Red-Eyes B. Dragon is a really reliable high-Level non-Tuner monster thanks to cards like The Black Stone of Legend and the piles of cards that can Special Summon Red-Eyes from the Graveyard. Remember, nearly everything that can revive a Blue-Eyes can ALSO revive Red-Eyes. As a Level 7 monster, it pairs perfectly with Sage with Eyes of Blue or another Level 1 Tuner to Summon Scarlight Red Dragon Archfiend, and from there things get really fun. Once you make one Synchro Summon, the extra Normal Summon from Mausoleum of White can be spent on Chain Resonator, which then can Summon another “Resonator” from your Deck, letting you quickly climb up to your most powerful Synchro Monsters. Synkron Resonator is perfect for this, since if you Synchro Summon with Chain Resonator first, Synkron can add it back to your hand shortly thereafter. Fun Fact: There’s no “once per turn” clause anywhere on Chain Resonator, and the same goes for the “add back a ‘Resonator’” effect of Synkron Resonator. All of this is extremely cool, but there’s even more where that came from! Chiwen, Light of the Yang Zing is a Level 1 LIGHT Tuner. So is Alien Ammonite. There are numerous “Fabled” monsters that fit the bill, including both The Fabled Catsith and The Fabled Peggulsus. Buster Whelp of the Destruction Swordsman also works. In fact, one of the more interesting plays that cropped up lately involved Normal Summoning Sage with Eyes of Blue and Buster Whelp of the Destruction Swordsman, then Tributing the Whelp to Summon Buster Blader and assemble the Synchro Materials for Buster Dragon. While Sage with Eyes of Blue and Mausoleum of White were certainly made to help out Blue-Eyes White Dragon Decks, that doesn’t mean that’s all you can use them for! There are plenty of strong, creative, and fun ways to use these cards even if you have no interest in building a Blue-Eyes Deck. Give some of them a try! The Return of the Dragon Lords is Nigh! Shining Victories is here!